"How does diversity (differences) within one population of invasive species affect an ecosystem?" She has researched how the invasive seaweed, Gracilaria vermiculophylla affects local organisms, such as amphipods and worms. Courtney's research also looks at the relationship of predator and prey in the marsh. Check out the links below to learn more about these experiments! December 2014, Courtney defended her masters thesis. 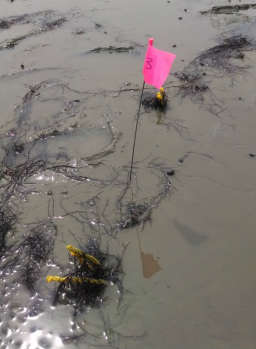 Her field survey and experiments demonstrated that polycultures of an invasive red seaweed Gracilaria vermiculophylla can have higher growth rates than monocultures do. Genetic diversity benefits ecosystem functioning and services within most species, but in this invasive, genetic diversity may facilitates invasion success. Elementary students? Let's break this down!